But what I really longed for in those situations was acceptance. My heart yearned to know I had a place, to be assured I was loved, for someone to say, “I choose you.” It took me a long time to learn that someone had already done all of those things. Jesus called my name as a little girl and tossed the ball of faith in my direction. And in a quiet bedroom at my grandparents’ house I told Him I wanted to be on His team. Jesus revealed that His mission for me doesn’t require someone else opening a door. Instead it’s about keeping the door of my own heart open to how He wants to use me each day. I used to believe acceptance was something someone else had to give me. I’m starting to see it’s about embracing what’s already mine. I am already accepted. You are already accepted. Our stories may be totally different but that heart-freeing truth is the same for all of us today. God, thank you for accepting us. You are the only One who can fill our hearts with what we long for most. Because of Your grace You embrace us even on the days when we fall short or feel like we have nothing to offer. Your acceptance of us isn’t about who we are but about who YOU are. That means we can’t earn it and we can’t lose it. We’re secure in Your love and no one can ever take it away. We choose to rest in that miraculous reality today. Amen. Subscribe for posts and free goodies. Thank you Holley. This was just what I needed to be reminded of this weekend. It’s hardest when those excluding you are family. You reminded me of my salvation a few years ago with your book & this morning you’re speaking right to the deepest heart of my longing. Loved this blog Holley. What a sweet memory of where you met Jesus…”in a quiet bedroom at your grandparents’ house”. I’m a grandma of 6 awesome grand kids so that is a special ‘line’ to me. Praise God, we are all ‘accepted’ by Him. And saying ‘yes’ to Him starts us off to find His beautiful plan for our life. Wow…this could have been written by me…I also have struggled with this and I also accepted Christ in a quiet bedroom of my grandma’s house one night when I was spending the night there. Thank you for your words. Dearest Holley, Thanks sooo much for posting this–I just opened it after sending a life changing email, and your words were a confirmation, an answer to a lie that tried to lodge in my spirit related to that email, and quite frankly, a big hug from Heaven. I thank God for you. Thanks for being Jesus cheering me/us on! Jasmine, I do not know you but how fun to see you here… I am from Holland but living in the States. I have not run into many Dutch (or in Holland living) bloggers. Great to see that pop up today. 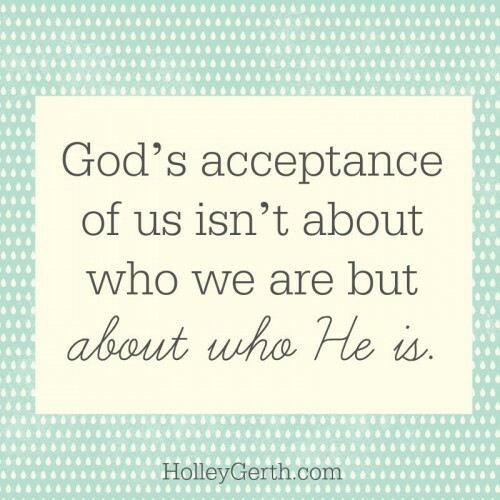 This is a wonderful reminder, Holley, about God’s acceptance and how each day he gives us His acceptance, no matter if we’ve had a good or bad day! Your words are a gift to me this morning… thank you! Love this, Holley! Even when we “know” this truth, life has a way of eroding the sense of the reality of it on more days than we would wish. Good words! Great reminders!! Thank you!! Thank you for reminding me that I am excepted by my Father in Heaven. I remembe being bused in Boston. We went to school with glass in our hair every day for two years. No one would play with us at recess and lunch. I was in second grade. The teacher ignored my hand all the time. When my third grade teacher taught me to read. I made her a promise that I would teach others. That is why I am a teacher. I found Jesus again through my daughter. So now I want others to know that God’s love is alive and well. Do keep reminding us that God loves us all. Thanks for the reminder. This statement especially spoke to me: “Jesus’ mission for me doesn’t require someone else opening a door. Instead it’s about keeping the door of my own heart open to how He wants to use me each day.” We often hear that success happens as a result of WHO you know, rather than WHAT you know. We Christians do know the One who opens coors, creates opportunities, etc. — Jesus. Our only concern is: remain open to Him and what He wants us to do today. A wonderful post, Holley, as always! Praise God that we are accepted, loved, adored and cherished – forever and evermore. Oh Holly, I really, REALLY needed this post today. Ever since I heard you speak at a writer’s conference in Indiana several years ago and you told the group how you shut yourself away in prayer for a weekend retreat to find God’s plan for your writing, and then you ended up with a 3 book deal I have held on to that kind of promise for me. But trudging in the writing-trench gets wearisome, and sometimes the promise seems so distant and faint. Thank-you, thank-you, thank-you for your words today. The offer the water of the spirit to my parched writer’s soul.